Click the map below for a larger, interactive google map. Scroll down for a detailed topographic map of the immediate area. Take Hwy 400 North from Toronto to Hwy 69. Follow 69 north past Parry Sound. Turn right (east) on to Hwy 522. Continue east on the 522 for approximately 15 minutes to Lost Channel Rd. Follow the signs 1 km south to the Lost Channel Marina. We look forward to meeting you there. The Clear Lake Eco Retreat is on 50+ acres of private, non-road accessible property and backs on to a massive expanse of crown land. 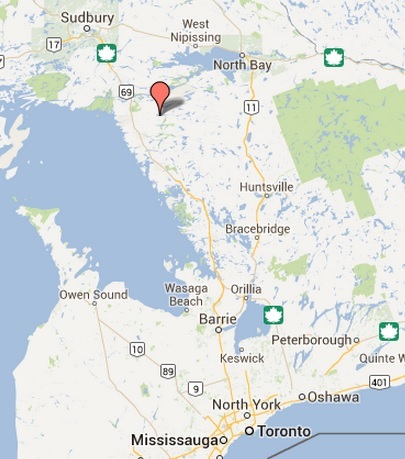 We are a quick 2 km boat ride from the Lost Channel Marina at Kawigamog lake.